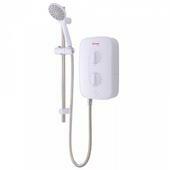 Instant electric showers are economical because they only heat the amount of water you require on demand. As they run independently from your hot water boiler system, you can still have a hot shower even if your boiler isn't working. Installation is relatively simple as they only require a cold water feed and an electrical connection. 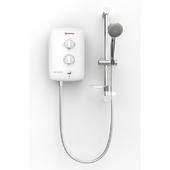 This category contains a large range of instant electric showers manufactured by Redring, one of the UK's leading water heating brands. 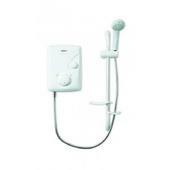 The quality is high due to the decades that Redring have spent honing their range and constantly developing new shower technology to keep up with the market's demands on efficiency and performance. 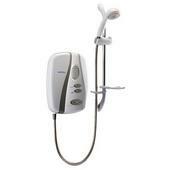 The most popular type of electric shower. 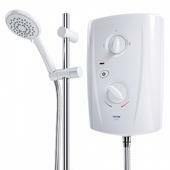 These showers run on standard mains cold water pressure, the water is heated quickly as it passes through the unit and delivered at a performance that is linked to the incoming water pressure. Power ratings range from 7.2KW to 10.8KW. The higher the power rating, the faster the shower can heat the water as it moves through the unit, thereby allowing faster delivery speed at higher temperature settings. Bear in mind that higher power units require larger electric cables and higher rated circuit breakers back at your fuseboard. Some models feature "Smart Stop" which helps to reduce scale build up in hard water areas. 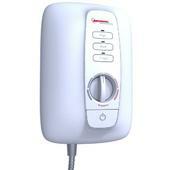 Doesn't heat the water, power is only required to operate the internal pump. 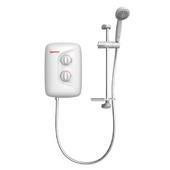 The integral pump in these showers can deliver water at up to 14 litres per minute for high shower performance. The hot water feed is taken from the cylinder and the cold water from the header tank in a simple to plumb installation. 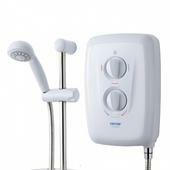 Choose from thermostatic and manual models. 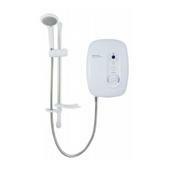 Redring's Selectronic shower range is designed for increased safety with the blind, partially sighted, young children, elderly and less able. Pre-programmed to deliver the water at safe temperatures, they can also be locked to cap the temperature at 40 degrees C to remove any possibility of accidental increase. Longer rails and hoses are supplied as standard. 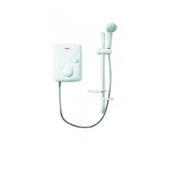 The Selectronic shower range is also endorsed by the RNIB. Available in 8.5KW, 9.5KW and 10.8KW ratings and also with level access and remote options on some models.